Coffee and beer have to be the top two beverages Austin survives on. It’s easy to find either–and often both–at cafes and breweries all over the city. 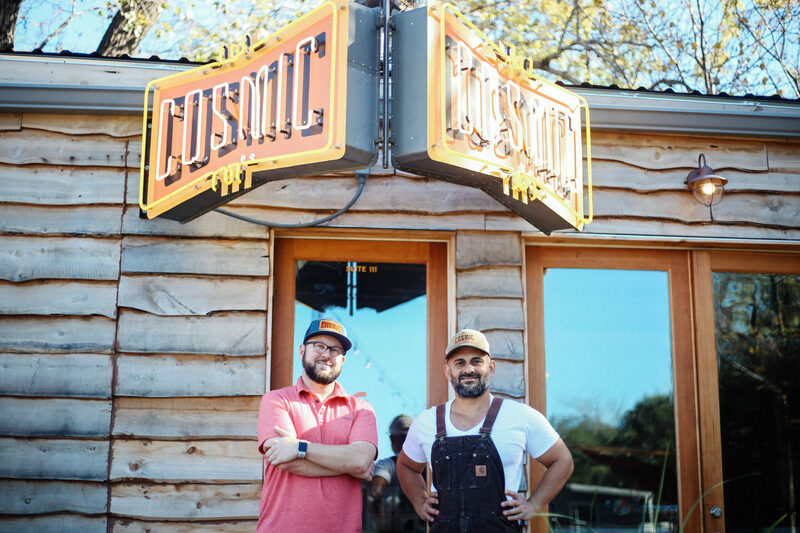 The newest member of the coffee-beer-hybrid is Cosmic Coffee + Beer Garden off South Congress near Ben White. 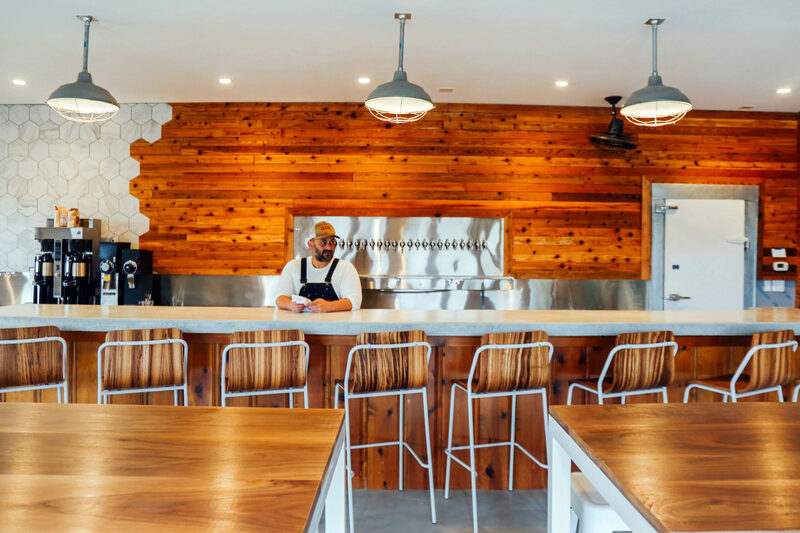 Cosmic isn’t an ordinary coffee shop or beer garden, but the culmination of co-founder Paul Oveisi’s passions: live entertainment, sustainability, beer, coffee, and food. I had a chance to sit down with the entrepreneur for a chat about the interesting history behind Cosmic Coffee + Beer Garden. This fascinating story is full of surprises. A native Austinite, Oveisi’s life growing up in Austin could be a scene from “Dazed and Confused.” But when adulthood beckoned, Oveisi chose to study pre-med. In the course of those studies, John Grisham’s influence led Oveisi to change direction to pre-law. He became a lawyer and spent a few years practicing one of the most stressful professions on the planet. Oveisi eventually realized being a lawyer wasn’t his calling, and found himself gravitating towards live music. With that, his first venture came to life: Momo’s. In its 10 years, Momo’s became a cultural touchpoint in Austin, nurturing many musicians in its heyday. Acts like Band of Heathens and Los Lonely Boys played some of their first shows here. Momo’s was more than a musical melting pot for Oveisi. Through it, he found a love for the hospitality industry. After the live music venue closed in 2012, he moved to New York City, where he participated in multiple hospitality projects as consultant and co-founder. Oveisi gained his hospitality chops during his time in the competitive Big Apple scene. Claiming multiple successes, he parted with New York City and headed back to Austin. On his return, he dove into the world of sustainability and permaculture. At its core, permaculture is a method of working with nature, rather than against it. It promotes sustainability and agriculture in a way that’s beneficial to all in an ecosystem. Oveisi spent a couple of years getting acquainted with urban farming practices, becoming a certified permaculture designer. What Does This Have to Do With Cosmic Coffee? I bet you’re wondering why I’ve been going on about Oveisi’s life. It’s simple. Without his story, Cosmic Coffee + Beer Garden wouldn’t exist. Every one of his experiences developed a passion, and Cosmic is the embodiment of it all. 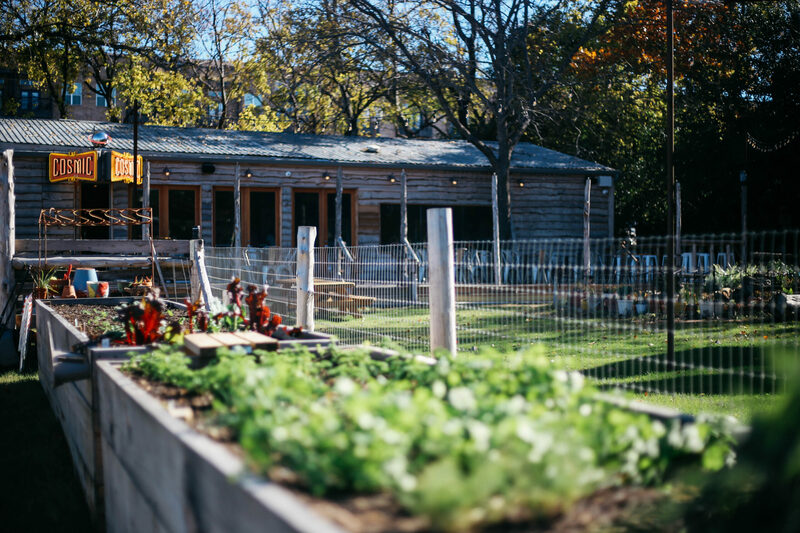 Cosmic Coffee + Beer Garden is about coffee, beer, food, and live entertainment, in a venue built on the tenets of permaculture. Oveisi is in business with local beer and coffee suppliers, and even purchases locally-produced liquor as much as possible. Barbecue food truck LeRoy and Lewis has also found a home, extending the theme of local supporting local. Leftovers from the food truck go to Cosmic’s chickens, who love good barbecue as much as the next Austinite. In return, the chickens have been a steady source of eggs for Oveisi and his staff. Composting is used to feed the vegetable garden, which is a solid source of produce and herbs for the food truck and cocktails. 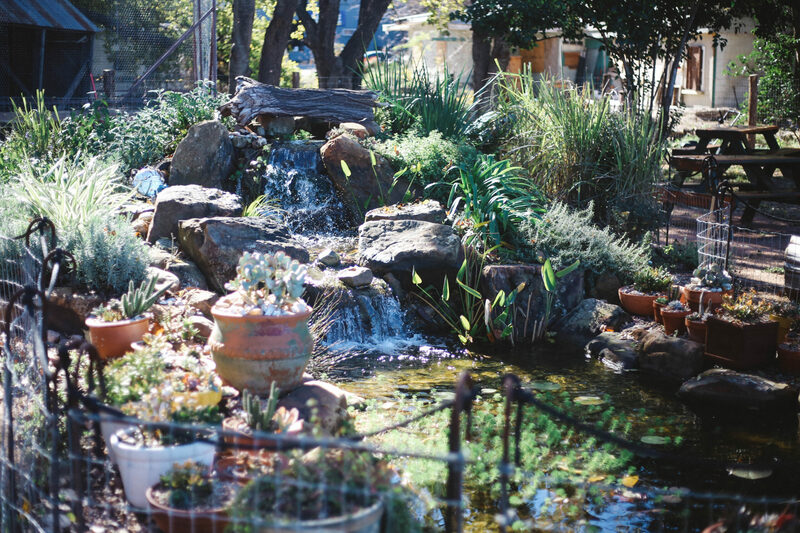 The pond at Cosmic is not only beautiful, but home to several species of fish and plants–a complete ecosystem in itself. I had a great time learning about Cosmic Coffee + Beer Garden and its origins. Oveisi’s story is so compelling that I’m sure you understand why I had to tell it. Cosmic is not pretentious or ostentatious. It’s simple and humble, just like its owner. If you see Oveisi walking around in his trademark overalls, be sure to say hi, and get a story or two out of him. How do you like to relax at Cosmic Coffee + Beer Garden?